The first thing that comes to the mind, when one thinks of Lord Rama, is the temple at Bhadrachalam situated on the banks of the river Godavari. The Temple was constructed in the 17th Century by the then Tahsildar, Kancharla Gopanna, popularly known as Bhakta Ramadasu, a fervent devotee of Lord Sri Rama. Bhadrachalam is a “Punya Kshetra” as Lord Seetha Ramachandra Swamy together with Laxmana exists as Swayambhu Murtis as promised to Bhadra Maharshi. 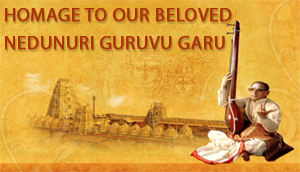 The importance of Bhadradri kshetra is explained in Sri Bramhanda Purana, Goutami Mahatyam. Sri Rama of Bhadrachalam is known as “Vaikunta Rama because he has Conchi(Sankha) and discus (Chakra) the emblems of Vishnu. The existence of deities, according to local tradition was first revealed in the dream to one Pokala Dammakka. She was the first to come, identify and offer worship to the idols. She was asked to continue worshipping the lord until a day when one bhakta (Ramadasu) would arrive and take up the responsibility of the temple. Ramadasu realized that he had been appointed and sent to the place only to serve the lord and he immediately decided to dedicate the rest of his life for the same. Ramadasu is said to have composed nearly 200 ramadasu keerthanas on bhadrachala ramadasu, most of which are available to us through Bhajana sampradaya. Some of the kirthanaas are available to us in the traditional tunes while some were composed recently by eminent artists like Sangeetha Kalanidhi Nedunuri Krishna Murthy, Padmabhushan Mangalampalli Balamurali Krishna, Malladi Suri Babu among many others. Ramadasu has also composed ‘Dasaradhi Satakam” , a string of 103 padyams, dandakam and churnika. Here is the list of Bhadrachalam Temple Festivals 2018. Bhadrachalam Sri Seetha Ramchandra Swamy Temple is one of the popularTemples dedicated to Lord Sri Rama in India. Apart from the above festivals, vratas, and utsavams, Swamyvari Parikramana Seva is celebrated on every Friday, Ekadashi, Purnima, Amavasya Sankramana. Laksha Kumkumarchana on Bahula Ekadashi in every month. Jan 21 - 28, 2018.